The 3 star Hotel Arcadia is located 20 minutes far from Rome's historical center, only few minutes from the roman ruins on Via Appia Antica and from one of the most famous Shopping Malls of the city. The Hotel is a good choice for people who arrive from the airport of Ciampino due its vicinity and easy connection. Not far from the hotel, there is the famous Castel Gandolfo area, with the Pope's summer residence, and its suggestive lake of Albano (wellknown as "Castelgandolfo Lake"). Thanks to the useful free shuttle service (in limited hours) to the Metro stop "Anagnina", you can reach the main historical sights of the Eternal City such as the Trevi Fountain, the Spanish Steps and the Colosseum just in a few minutes. The Hotel Arcadia will let you live the city in a peaceful district, far from the traffic of the city center. Thanks to its equipped gym, its charming terrace-solarium, its comfortable snack bar and a large free parking place available, the hotel can be the best place to stay for an unforgettable break in Rome. 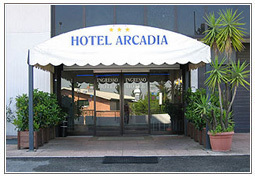 Hotel Arcadia Official Site - Lowest Rates on the Web!